Los Angeles, CA – June 23, 2017: Habitat for Humanity of Greater Los Angeles (Habitat LA), along with the City of Montebello and Partnership Housing, are proud to celebrate the completion of four new, affordable homes with a dedication ceremony on Wednesday, June 28 from 11am – 12:30pm.This marks the first development in partnership with the City of Montebello to bring affordable homeownership opportunities to the area. This neighborhood would not have been possible without the generous support of the City of Montebello, Partnership Housing, Bank of America, the Habitat LA Catholic Coalition and Grifols. For these families, the journey to homeownership included trainings and classes through Habitat LA’s Family Investment Program, as well as completing 500 hours of sweat equity building their own home and the homes of other future homeowners. Each family has good credit and will pay back a zero-equivalent mortgage, ultimately providing them with the foundation for strength and stability for their future. These homes are two story units with three bedrooms and two bathrooms. Additionally, each house includes a number of green features including drought tolerant landscaping, electric car charging ports, energy-efficient heating, insulation made from recycled content, low-flow plumbing fixtures, and solar ready systems. Since 1990, Habitat LA has built, renovated and repaired nearly 800 homes locally, helping to transform the lives of more than 4,000 Angelenos. By 2020, Habitat LA has a goal to invest $100 million into revitalizing neighborhoods and increasing access to affordable homeownership and home repair opportunities as part of their Building a Greater Los Angeles campaign. This investment will benefit the local economy by building strong and stable homes in partnership with families, individuals, volunteers, municipalities and donors, which will bring strength and stability to local communities throughout greater Los Angeles. Stay informed on all Habitat LA events and news on Twitter @HabitatLA (#BuildLA), Instagram @HabitatLA, and Facebook. Partnership Housing Inc. is a non-profit housing development company that seeks to eliminate poverty housing by working with economically disadvantaged people to help them create a better human habitat in which to live and work, the primary goal being to provide decent, affordable housing to individuals and families. Partnership Housing Inc. serves hardworking families who are typically renters, many of whom are living in overcrowded apartments that have fallen into disrepair. 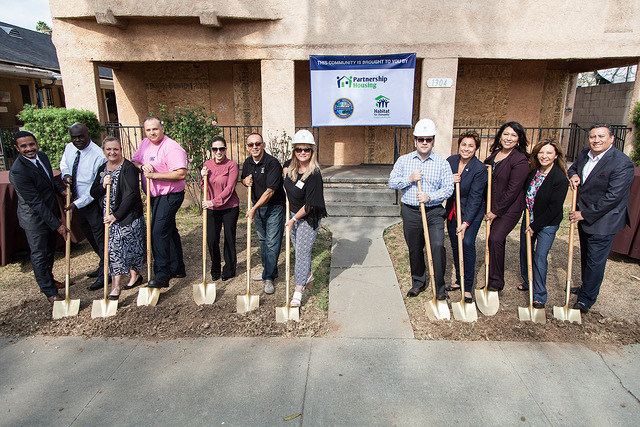 Partnership Housing Inc.’s parent company, Habitat for Humanity of Greater Los Angeles, completed its first affordable home in 1993 and has continued to provide affordable homeownership opportunities in the Los Angeles County area since then.